Get Higher Rankings, More Earnings, and a Motivational Kick with This In-Depth System for Building Profitable Websites…That Stands the Test of Time. Be Honest… Does This Sound Familiar? Have you ever had a brilliant business idea that you just KNEW was going to be successful? At first, you are super motivated to go out and tackle this idea. But then something happens 2 weeks later…you have ANOTHER idea! So, you put the first idea on the shelf and start on the second one…but then you guessed it, you have a 3rd idea that’s even better, so you move from idea 2 to idea 3. Before you know it a year has passed and you have a dozen incomplete projects and nothing has really changed in your life. In fact, the shiny object syndrome is one of the biggest problems that potential online entrepreneurs have. You lack focus, because there are SO many exciting possibilities out there. What’s the process I follow to start and grow a website? How do I get high quality links to my site? 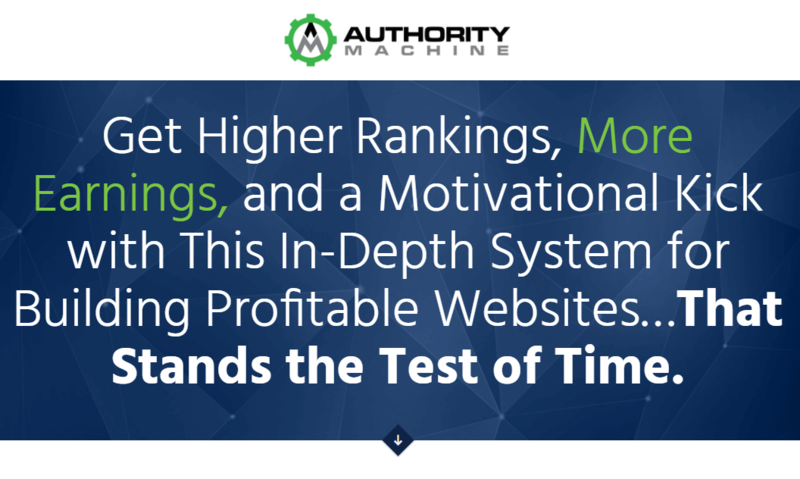 Authority Machine is a 8 week INTENSE training course that was created specifically to help get out of the shiny object rut and start focusing on building a website with a proven plan to success. You already know that the key to long term financial success is to build something that has true value, not a one page website that gets a bunch of spammy links. If you want to rank in Google, you have to do it right from the very beginning. We are going to give you the exact system we use to build, rank, and scale large web properties. We’ll hold your hand while you get your first few high quality links to your website through Infographics, guest posting, contributor accounts, and other advanced strategies. No more shiny object syndrome. Once you join the machine, the machine won’t let you quit. You won’t have to waste all your time putting loads of effort into ideas that you never should have been going after in the first place. At the core of everything you will learn are the skills to take your business to higher profitability through increased traffic and earnings with your website. At the core of the machine is a group of motivated online business builders (like you) as well as the coaches that can and will lead to long term network to help support you on your journey. Hayden is the co-founder of Wired Investors, is a thought leader in the content marketing niche, and runs the popular blog NoHatDigital.com. He has built and scaled several six and seven figure content businesses and has deep experience developing systems to scale content sites. Scott has been building and scaling online businesses since 2013. By developing detailed systems and processes that allow his businesses to run on autopilot he’s been able to grow and sell a number of 6 figure online business without being involved in the daily operations. Tom worked in the corporate world for several years while dabbling with niche sites online. He finally took the plunge and quit his job last year to work online full time. He is currently scaling his own product business as well as manages a few authority sites. You may be familiar with Spencer’s blog NichePursuits.com. This is a great example of a type of site we are going to teach you to build. Spencer has grown this site from nothing to thousands of visitors a day with no stop in site. Spencer has launched multiple six-figure businesses off the back of NichePursuits.com, and it truly is a highly valuable web property. The best part is that approximately 57% of all visitors to NichePursuits.com are new, and 54% of all traffic to the site is from search engines! You may also be familiar with Spencer’s work at LongTailPro.com. This seven-figure business was grown from the natural search engine traffic coming from NichePursuits.com at first. However, LongTailPro.com has now because a traffic beast in it’s own right! Between 500 to 600 unique visitors a day are coming directly from Google to LongTailPro.com. And in case you didn’t know, ranking for anything related to keyword research software is EXTREMELY competitive! A single click using Google Adwords can cost up to $10 or more. This search engine traffic would cost nearly $5,000 a day if you were try to replicate it with paid sources. You may think, well that’s great that you’ve been able to build a couple of great sites selling your own products, but what about affiliate sites? And here’s an example brand new site in the home goods niche that has grown month after month using the EXACT principles that you are going to learn in Authority Machine. It just so happens that this site now sends traffic to Spencer’s Amazon store, where he sells over $60,000 a month of home goods on Amazon. This example is a special one. This is a site we purchased just a few months ago, and then “hired” several interns to go through our EXACT process that we are going to teach you in Authority Machine. The result? After the interns that went through our training and added lots of highly targeted content, the traffic increased by 64% compared to just 3 months previous. We believe we have taken the website value from $68k (what we bought the site for) to $128k today (what we could sell it for based on increased traffic and earnings in just 3 short months). The processes we used on this site is exactly what you will learn in Authority Machine. Is Authority Machine Right for You? The Machine was created to teach those that want access to a world-class system for building, ranking, and profiting from legitimate websites that stand the test of time. If you have been building websites for years, but never really been able to put together solid systems or a sustainable business, you will find the machine especially helpful! This is a more advanced program that doesn’t waste a ton of time on the beginner stuff. We just right into the advanced material almost from day one! If you are brand new to online businesses, this training program will show you all the steps you need to go from no website to ranking in Google and profiting from your efforts. However, you better be willing to learn QUICK, because we don’t hold back the advanced material. In addition to all the things you’ll learn and skills you’ll develop, here are a number of unique bonuses that you’ll get by being part of the Authority Machine. You’ll be building an invaluable network of contacts during this process, and after the 8 week course you’ll have full access to a private Facebook group that is only for graduates of Authority Machine. 2 Live Q&A Webinars – One at the beginning and one at the end with live question and answer opportunities. You’ll have a full 8-weeks worth of training and materials that will require approximately 10-15 hours per week from you. Access to an active Skype group with other students and coaches to answer questions you may have along the way. We’ll give you various checklists and worksheets that we’ve used ourselves to hire outsourced help, and even standard operating procedures (SOP) that we use to systematize various parts of our businesses. If you’re a visual learner, you’ll love our how to videos that teach you how to do many of the essential things you need to be successful. In addition, we’ll send weekly training emails to keep you up to date and motivated. We’ve proven our methodology through testing, and you’ll get access to all of our ongoing case studies as well as our contributor accounts to various high authority sites that we frequently guest post on. Just so there are no surprises, here’s a week by week breakdown of what you’ll be learning and working on during our 8 week program. We’ve validated our program through past internships, which has allowed us to focus on topics that will give you the most benefit. By week 5, you’ll be publishing the content you’ve been working on and outsourcing. You’ll also get your first linkable asset completed, which will be key for your linkbuilding efforts. The substance of the training and the spreadsheets are invaluable. I think that alone is worth the price of admission – Your whole process is eye opening and i’m so glad that I did this. It literally took 3 years off of my road to success. This was one of the best investments of my time (and money) that I’ve made in a long time. Having the opportunity to work with digital marketers of all different skill levels was both inspiring and wonderfully helpful. We were able to bounce ideas off of one another and supportively correct each other’s mistakes. Being able to ask questions to someone who does this professionally has helped me to learn more over the course of a month than in the year of me trying to build sites on my own. I got so much out of this! All of your SOP’s makes so much sense. You guys definitely ROCK …Thank you so much for delivering tremendous! The internship is great. I have learned so much that I plan to put to use right away. I already have plans to partner with another intern on a site once the internship is over. This has been a great experience. The step by step training has been comprehensive and very clear. The SOP’s and sheets are a great bonus and I’ll be using these when setting up my own sites for sure. We’re so confident that you’ll love the in-depth training and hands on instruction in the AuthorityMachine that you can try it out for 7 days and get your money back if you aren’t satisfied for any reason. We’ve eliminated the risk, so now it’s time to get started on your journey!